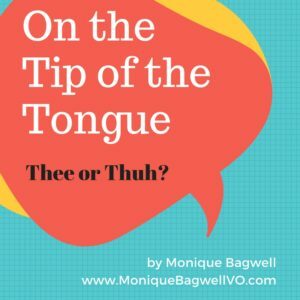 However, when we are “reading” written material aloud to others, we do want to be conscientious of when to use “thee” vs. “thuh,” especially if we want to sound “natural” and “conversational” when we speak. Otherwise, we risk sounding as if we are “reading,” and therefore can give an impression of being disconnected with the text or our audience. My students also were confused on how to pronounce the indefinite article “a.” Do you say “AYE” or “UH?” The general rule when speaking aloud is to always pronounce indefinite article “a” as “UH.” For example, “UH dog sat on UH chair eating an apple.” Again, if we say “AYE,” then it sounds as if we are reading, and can cause a sense of detachment between us and our audience. I hope you enjoyed this speech tip, and that you will use it next time you want to become UH more natural sounding speaker for THEE audience at THUH presentation you may be giving.